I’ve enjoyed most of my time working in academic science in the U.S. and Germany as a graduate student, a postdoctoral researcher, a research scientist and a lecturer. I’ve benefited from supportive mentors, talented colleagues and wonderful friends. I think I’ve accomplished a lot in terms of research, teaching, political advocacy and public outreach. Based on my experience and on anecdotal evidence, the system works well in some ways but is flawed in many others, especially involve the job market and career advancement. Reflecting on the past fifteen years, here are my current thoughts on problems with the system and ways it could be improved, with a focus on the U.S. and on the physical sciences, though the social sciences and life sciences face similar problems. 1. 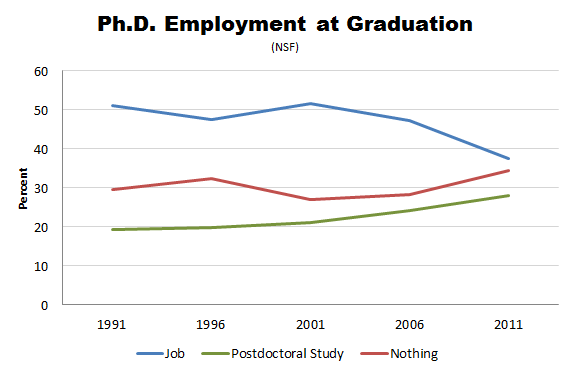 Let’s be honest: the academic job market is horrible. It was already pretty bad before the recession, and it is worse now. Many scientists move from institution to institution, working on many postdocs, fellowships, and other short-term jobs while seeking permanent positions or more secure funding, but these turn out to be increasingly elusive and competitive. (I worked at three positions over nine years since earning my Ph.D.) I’ve seen some tenure-track faculty positions receive well over 400 applications—I don’t envy the hiring committees there—and I’ve seen some grant proposal success rates drop well below 10%. This system causes people a lot of stress; from a societal perspective, in this situation, how well can people work under such pressure and job insecurity, and how much can they accomplish when they must perennially focus on job applications and grant proposals rather than on the things that drew them to their profession? 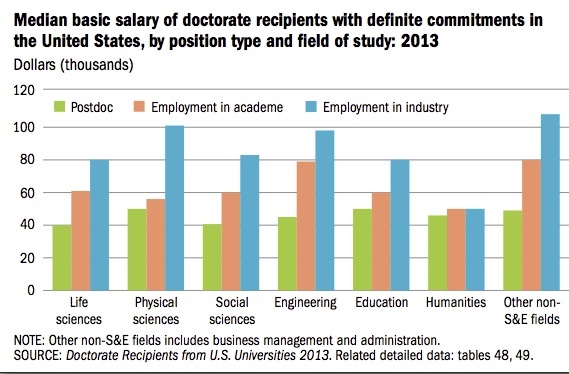 If the scientific community wants to attract the best scientists, then shouldn’t we strive to make their jobs more desirable than they are now, with better pay and security? As Beryl Lieff Benderly wrote in the Pacific Standard, “unless the nation stops…’burning its intellectual capital’ by heedlessly using talented young people as cheap labor, the possibility of drawing the best of them back into careers as scientists will become increasingly remote.” In much the same way, the inadequate job prospects of adjunct faculty renders the possibility of drawing the best teachers and retaining them similarly small. People have been diagnosing these problems for years, but no clear solutions have emerged. In my opinion, the job market situation could be gradually ameliorated if many institutions simultaneously sought to improve it. In particular, I think scientists should have longer-term postdoctoral positions, such as five years rather than one, two or three. I also think faculty should hire fewer graduate students, such as one or two at a time rather than, say, five of them, regardless of how much funding they happen to have at the time. I also think that colleges, universities, and national labs should allocate funding for more staff positions, though of course that funding has to come from somewhere, and tuition and student debt are already too high. On the other hand, some people argue that university administrations have ballooned too much over the past few decades; others argue that some universities spend too much money on their sports programs. 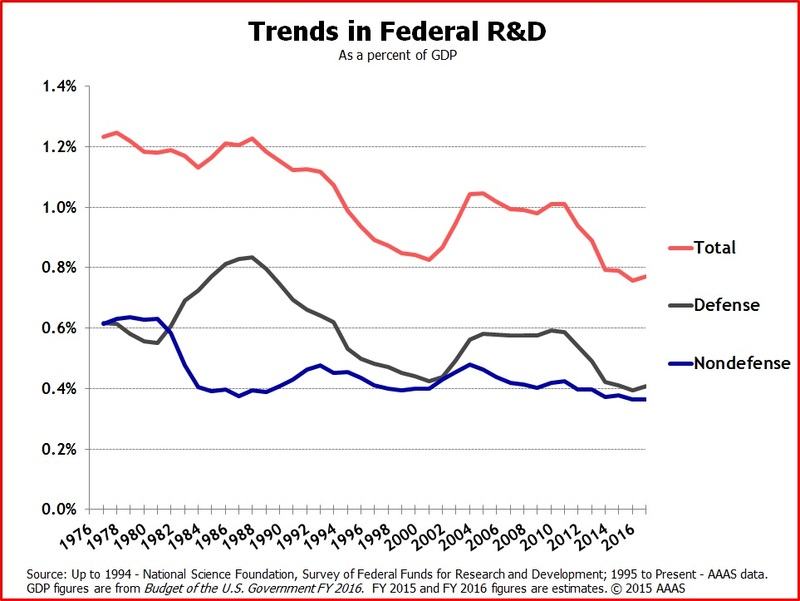 In addition, federal funding for “basic research” (as opposed to applied research) in science should be increased, as such grants often supplement university funding. 2. We can considerably improve the graduate student experience as well. Many university departments and professional societies now give more information about academic career prospects to students than before, and it should be their official policy to do so. Furthermore, students should be encouraged to explore as many of their interests as possible, not just those focused on their narrow field of research. If they want to learn to teach well, or learn about computer programming, software, statistics, policy-making, or the history or philosophy or sociology of their science, or if they want to investigate interdisciplinary connections, or if they want to develop other skills, they should have the time and space to do that. Universities have many excellent resources, and students should have the opportunity to utilize them. We know that only a fraction of graduate students will continue in academia, and the best scientists will be well-rounded and have a wide range of experience; if they move on to something else, they should be prepared and have the tools and expertise they need. 3. The scientific community can take this an important step further by acknowledging the many roles and variety of activities scientists engage in in addition to research: teaching courses, participating in outreach programs, advancing efforts to improve diversity, becoming involved in political advocacy, developing software and instrumentation that don’t necessarily result in publications, etc. Many scientists agree that we do not sufficiently value these kinds of activities even though they are necessary for the vitality and sustainability of the scientific enterprise itself. For example, in a new paper submitted to the Communicating Astronomy with the Public journal, the authors find that many astronomers think a larger fraction of their grant-funded work (up to 10%) should be allocated to education and public outreach (EPO). EPO are included among the “broader impacts” of National Science Foundation grants, but much more can be done in this regard. All of these activities should be explicitly recognized by the relevant federal agencies during the evaluation of grant proposals and by departmental hiring committees when assessing candidates for jobs and promotions. Therefore, a corollary follows: if the community appreciates a wider scope of activities as important components of a scientist’s job, then it is not necessary to relentlessly pursue published research papers all of the time. Perhaps this could alleviate the “publish or perish” problem, in which some scientists rush the publication of insufficiently vetted results or make provocative claims that go far beyond what their analysis actually shows. That is, endeavoring for a more open-minded view of scientists’ work could improve the quality and reliability of scientific research. In practice, how would this be done? Scientists could organize more conferences and meetings specifically devoted to education research, outreach programs, policy developments, etc., and the proceedings should be published online. Another way a scientist’s peers could be aware of the wider scope of her non-research work would be to have different levels of publication involving them, from informal social media and blog posts to possibly peer-reviewed statements and articles that could be posted on online archives or wiki pages. For example, if she participated in an outreach project with local high school students or in Congressional visit days, she could speak or write about the experience and about what worked well with the program and then publish that presentation or statement. Furthermore, since research projects can take years and many grueling steps to complete, often by graduate students toiling away in their offices and labs, why not reduce the pressure and recognize the interim work at intermediate stages? Some people are considering publishing a wider scope of research-related work, even including the initial idea phase. A new open-access journal, Research Ideas and Outcomes, aims to do just that. I’m not sure whether it will work, but it’s worth trying, and I hope that scientists will be honorable and cooperative and avoid scooping each other’s ideas. On that note, as some of you know, I will make it official that I am leaving academic science. (In my next post, I will write about what I am shifting my career toward.) As a result, I will be unable to complete many of my scientific project ideas and papers, and for the few astrophysicist readers of this blog, I will not be annoyed if you run with them (but please give me proper credit). My next four projects probably would have been the following: modeling galaxy catalogs including realistic dynamics within galaxy groups and clusters within dark matter clumps of the “cosmic web”; assessing observational and theoretical problems in the relation between galaxy stellar mass and dark matter halo mass; modeling the mass-morphology relation of galaxies using constraints I previously obtained with the Galaxy Zoo citizen science project; and modeling and analyzing the star formation rate dependence of the spatial distribution of galaxies in the distant cosmic past. I am happy to give more details about any of these ideas. 4. We should also address the problem of academic status inequality. If a person makes it to an elite university or has the opportunity to work with a big-name faculty member or manages to win a prestigious award, grant or fellowship, that is an excellent achievement of which they should be proud. Nevertheless, such a person is essentially endorsed by the establishment and is much more likely to be considered part of an in-crowd, with everyone else struggling in the periphery. In-crowd scientists then often have an easier time obtaining future opportunities, and like an academic capitalism, wealth and capital flow toward this in-crowd at the expense of the periphery scientists. On the one hand, the in-crowd scientists have accomplished something and the community should encourage them to continue their work. On the other hand, scientists are busy people, but they can also be lazy; it’s too easy to give an award to someone who as already received one or to hire someone from another elite institution rather than to assess the merits of the many people with whom they may be less familiar. 5. As I’ve written before, much more work can be done to improve gender, race, class and other forms of diversity when hiring students, postdocs and faculty and promoting them at universities. Furthermore, when organizing conferences, workshops, meetings and speaker series, diverse committees should explicitly take these principles into consideration. Even the most thorough and attentive committees must also beware of “unconscious bias,” which affects everyone but can be reduced. 7. The scientific community would also benefit from more opportunities for videoconferencing, in which people remotely present talks and field questions about them. As I’ve written for the American Astronomical Society Sustainability Committee, our biggest source of carbon emissions comes from frequent travel, and we should try to reduce our carbon “footprint.” Moreover, people at small colleges with small travel budgets and people with families who have a harder time traveling would appreciate this, as it would level the playing field a bit. Of course, there is no substitute for face-to-face interactions, but people continue to improve video tools with Skype, Google and many others, which could be utilized much more extensively. 8. Finally, I argue that everyone would benefit from more and better interactions between scientists, public affairs representatives and government affairs officials at universities. Such interactions would help scientists to present their accomplishments to a wider community, help universities to publicize their scientists’ work, and help political officials to understand the important science being done in their districts, often benefiting from federal and state investment. These are my current thoughts, and I hope they spark discussions and debates.